Weatherzone is Australia’s largest private weather service, established in 1998. Our company is made up of a team of highly qualified meteorologists who understand the effect the weather has on the day to day operations of businesses of all kinds. Our passion is giving you the information you need to manage your business effectively and efficiently by offering you solutions that are innovative, tailored, flexible and responsive. Founded in 1998, Weatherzone enjoyed immediate success in broadcast television, supplying to five major Australian networks. In 2000 Weatherzone launched its public website weatherzone.com.au, which quickly grew to become Australia’s most popular privately-operated weather website. During the 2000’s, Weatherzone diversified into other industry sectors, including agribusiness, energy, insurance, construction, oil and gas, retail, ports and mining. Weatherzone’s drive to understand each sectors’ true needs and commitment to quality forecast solutions has cemented Weatherzone as the market leader in many of these industries; notably being chosen as the main provider to the Australian Energy Market Operator in 2012 over the Australian Bureau of Meteorology and other providers, due to the accuracy of its OpticastTM model. Weatherzone has also created an unrivalled weather-related planning tool for the aviation industry, utilised by Australia’s national carrier Qantas, to improve operational planning and reduce costs through improved decision-making based on accurate information. Weatherzone strives to be the leader in the field through cutting edge science, listening to our clients’ true needs and finding solutions for safer and more efficient operations. Weatherzone services over 15 industries, including mining, agriculture, energy, ports, aviation, retail, insurance, broadcast media, digital media and more. We supply to private companies, government organisations and market regulators. 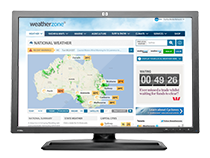 Big or small, Weatherzone has valuable weather solutions to improve your business.